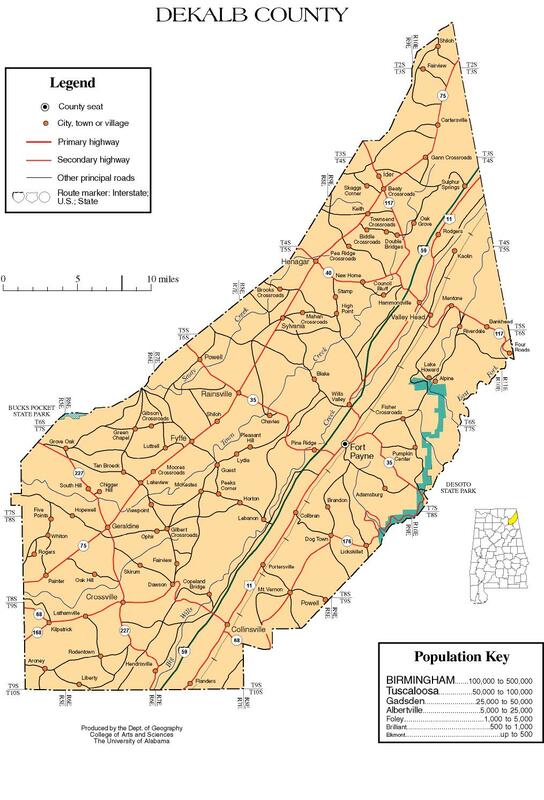 DeKalb County, Alabama was established January 9, 1836 from land that was ceded to the federal government by the Cherokee Nation and is named for Baron Johann Sebastian DeKalb, an American Revolutionary War hero. The county seat is Fort Payne, a name derived from the fort that was built during the forced removal of Indians along the”tot.htm”, as commissioned by Captain John Payne. Land that was originally occupied by the Cherokee Nation. 1780 – The area now known as Fort Payne and DeKalb County was Willstown and Wills County, named for Cherokee Chief “Red-Head” Will Weber. 1820’s – Sequoyah, Cherokee Indian known for creating a syllabary that taught an illiterate tribe to read and write, moves to Willstown. 1835 – Treaty of New Echota signed which brought about the forced removal of Indians and the tragic era of the Trail of Tears. 1836 – County officially named DeKalb County for American Revolutionary War hero Johann Sebastian DeKalb. February 1838 – Captain John Payne is commissioned by the Federal Government to command the local garrison of soldiers and see to the construction of a stockade to hold Indians before their march West. 1838 – Stockade was constructed and named in honor of its commander, Fort Payne. October 1838 – Last group to depart on Trail of Tears. 1840 – Lebanon becomes the fifth County Seat in four years and the first permanent County Courthouse is built. It served as County Seat for 38 years. 1860’s and 1870’s – The railroad comes to DeKalb County. 1869 – Fort Payne becomes official city name. May 5, 1878 – Fort Payne becomes County Seat.The current courthouse is one of three in Fort Payne to have been built since 1878. 1885 – Coal and Iron Ore are discovered. 1888 – The Fort Payne Coal and Iron Company is organized and the Boom begins. February 28, 1889 – The City of Fort Payne is incorporated. 1889 – the Fort Payne Opera House and the Hardware Manufacturing Company’s 3-story brick building is built. 1891 – The Fort Payne Depot is built. 1893 – Coal and iron deposits play out and a larger vein is discovered in Birmingham’s Red Mountain. Investors pack up and move South. Boom ends. 1900’s – Hosiery industry is born in DeKalb County. The Treaty of New Echota was signed in 1835, which was an agreement between the federal government and the Cherokee Nation that the Cherokees vacate their homelands east of the Mississippi. A majority of the Cherokees however opposed the signing of this treaty and therefore refused to leave. The treaty was enforced though and President Andrew Jackson sent federal troops to transport the Indians to new lands in the west. Troops, under the charge of General Winfield Scott, were sent to various points throughout Alabama, Tennessee and Georgia to build stockade forts and gather the Indians in preparation of their move west. Captain John Payne was sent to Willstown Mission (Will’s Valley – named for Indian Chief Red-Head Will), present day Fort Payne, to command the local garrison of soldiers and see to the construction of the stockade. Captain Payne chose a site “Two hundred yards northeast of Big Spring”, a place close to the present location of the Fort Payne Improvement Authority. The spring was a great provider of water for the Indians, soldiers and livestock. The stockade was built by 22 soldiers under the command of Captain Payne and was named Fort Payne. It was used for both an internment camp and a removal fort. Five stockades were built in Alabama with Fort Payne being the only internment camp in the state. Several groups of Cherokees departed during 1838 from Fort Payne with a guide provided by the federal government while others left under their own command. One such group was lead by Cherokee leader John Benge. He left with a group of 1,103 Cherokees, October 3, 1838. They followed what is now Alabama Highway 35 through Fort Payne to the top of Sand Mountain to Rainsville. They then followed what is now Alabama Highway 75 to Albertville then Highway 431 to Gunters Landing, now Guntersville. Failure of the federal government to provide ample means of transport for personal belongings, the Cherokees were forced to leave behind many of their prized possessions, further stripping them of their pride and human dignity. Their journey west was filled with hardships, suffering and illnesses and one out of every seven died before reaching the land they would then call home. Today there is no fort or stockade standing as a stark reminder of what the Cherokees and other Indian tribes endured. Instead historic markers stand where Indians once gathered to learn to read and write using an alphabet created and taught by Indian Chief Sequoyah and one where a fort once stood and held Indians against their will. While we can’t turn back the clock and undo this tragic act, we can at least bring awareness to it and educate others in the hope that this never happens again to another race of people. All Roads Lead to DeKalb County, Alabama! Travel the scenic highways and byways of the beautiful Northeast Alabama Mountains to view majestic overlooks, waterfalls and canyons, to stand on the edge of sheer rock cliffs and watch a mighty river meandering its way across a mountain, and to stroll through charming historic towns and villages. This is just the beginning of what there is to see and do in Lookout Mountain, Alabama. “contact.htm” and let us help you “suggested.htm” for your next vacation.